Creating awesome landscape designs is one of the specialties of Advant-Edge Decorative Curbing & Landscaping, Inc. For years, we have been providing Arizona property owners with exquisitely designed landscapes courtesy of our creative landscape design team. Call us now and we'll discuss with you how we can transform your ideas into stunning designs. If you are looking for a landscaping firm that can offer customized landscape design, we are the company to call. We know that clients have peculiar needs and preferences, so we always talk to them when creating landscape plans. Our close collaboration with clients and our deep understanding of the different design principles always result in excellent designs. 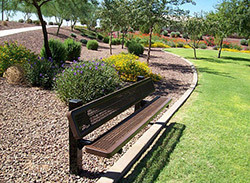 Our personalized approach to landscape design also helps us understand our clients' needs. We will only include in the design proposal the features and amenities that they need and want. Moreover, the landscape theme that we will adopt will also depend on their preferences. Our clients from Peoria and surrounding areas are assured of prompt completion of the design proposal because of our modern design tools. With our state-of-the-art design tool, clients can have a better visualization of the various landscape features and amenities. They can even suggest revisions or enhancements to make them more functional and attractive when installed. At Advant-Edge Decorative Curbing & Landscaping, Inc., we can handle the design requirements of residential and commercial clients. Our team can create the perfect design for small and large properties. They know the right features to include in residential landscapes and the amenities that will be perfect for commercial landscapes. If our clients request for specific features, we can easily incorporate them in the design plan. Plantings. We make sure that your landscape will have the right combination of annuals, perennials, shrubs, and trees. We can add mini gardens, hedges, and ornamental trees. Water features. We always recommend the inclusion of water features in our landscape design plans. They provide a unique ambiance and can become focal points in your landscape. Some great additions include ponds, waterfalls, and fountains. Outdoor living spaces. Landscapes should not only have beautiful gardens but must also include a place for rest and relaxation. And the best additions to your softscapes are outdoor living features, such as patios, decks, pergolas, outdoor kitchens, and sitting areas. Shade structures. We also recommend adding wooden shade structures to improve the aesthetic appeal of a landscape. These structures can be gazebos, pergolas, or arbors. 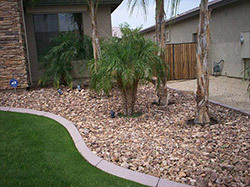 Since we are a locally owned landscaping firm, we only recommend landscape features that will be perfect for Arizona climate. We can design sustainable landscapes by using xeriscaping and other landscape design techniques. By using these methods, clients will not worry about the cost of maintaining the various landscape elements. Call us today at (623) 398-6319, and let us talk about your ideas and plans. 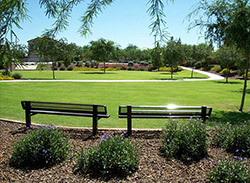 We can even show you some of our completed projects in Peoria, AZ just to assure you that we are the right landscape design company to hire.